A brief look at Grace Poe’s platform. Who will be the next president of the Philippines? Will it be administration candidate Mar Roxas, opposition leader and incumbent Vice President Jejomar Binay, or Senator Grace Poe who is currently leading in the surveys? Roxas is expected to continue the programs of President Benigno Aquino III, whose term will end in nine months. Binay was part of Aquino’s cabinet over the past five years but resigned his post last June and criticized the president. He vowed to lead a better government if elected next year. Who is Grace Poe? She topped the senatorial race in 2013, which many attributed to the popularity of her parents: actress Susan Roces and actor Fernando Poe Jr. The latter ran for president in 2004 but lost to former president Gloria Arroyo. As a neophyte senator who championed good governance and transparency, Poe’s popularity surged and many urged her to run for president as an alternative candidate. Even Aquino acknowledged her potential and even asked her to run as the administration’s vice presidential candidate. She politely refused the offer and instead declared her bid for the presidency last September 16. Poe also outlined her governance program. She affirmed some of the policies of Aquino, like the conditional cash transfer. But she also indirectly tackled the perceived failures of Aquino such as solving the heavy traffic in Metro Manila and improving the country’s public infrastructure. “We will make infrastructure development our priority, whether in terms of streets, trains, airports, seaports or the internet. We should build more roads and trains not only in Metro Manila but all over the Philippines. We should ensure that our train project is awarded to a contractor with strong capability and track record in long-term maintenance,” Poe said alluding to the botched train contract signed by the government. 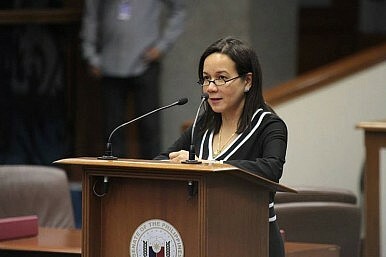 Poe vowed to increase the annual infrastructure budget to seven percent of GDP. Furthermore, she also mentioned several issues that affect both consumers and businesses, including her commitment to reduce individual income taxes, lower the power rates, and apprehend criminals. Poe said her government will draft an industrialization and information technology (IT) plan as part of an effort to encourage greater domestic production to create jobs. To combat corruption, she emphasized the need to pass the Freedom of Information bill. She also vowed to pursue peace talks with all armed groups operating in the country. She advocated the establishment of a separate Emergency Management Department that will focus on national preparedness, climate change and geo-mapping. The following day, Senator Chiz Escudero was introduced as Poe’s running mate. Both will run as independent candidates. Escudero is seen as Poe’s mentor; in charge of expanding political and electoral machinery. During his acceptance speech, Escudero christened the candidacy of Grace Poe as GP or “Gobyernong may Puso” (“A Government with Heart” in the local Tagalog language). More importantly, he specified how the duo, if elected, will implement its election agenda. “The next president will appoint and delegate over 5,000 people in government who will fill positions in 500 agencies, and will spend 18 trillion pesos over a six-year term,” he said. The Poe-Escudero tandem will face tremendous obstacles, especially since they are running as independents. Poe is also facing a disqualification case since her citizenship is being questioned by some petitioners. To be sure, Poe is a popular candidate. But this is not a guarantee of electoral victory or effective leadership. Now that her agenda for reform has been made public, one hopes that it will lead to more conversations and debates about the respective programs of all candidates. That will then provide an opportunity for the public to challenge or critique the visions and track records of all political parties. The Philippines Reaches a CrossroadsThe Race for the Philippine Presidency Has BegunWhy Duterte Needs to Put the Economy First in the PhilippinesWhy Another Philippines Terrorist Attack Is ComingIs Duterte Wrecking the Philippine Economy?